Just in time for Halloween! This fun way to learn about Halloween contains lots of gentle humor! Who says ghosts get to have all the fun on Halloween? In this humorous new addition to Jean Reagan and Lee Wildish’s bestselling How to… books, the kids are in charge! But in order to scare a ghost, you might have to find one first. Guided by a tongue-in-cheek instructional style, two children show young readers how to set the stage for a spooktacular Halloween by carving pumpkins, playing games, and even reading scary stories. Has a ghost showed up? Great! Now the fun–er, the scaring–can really begin. 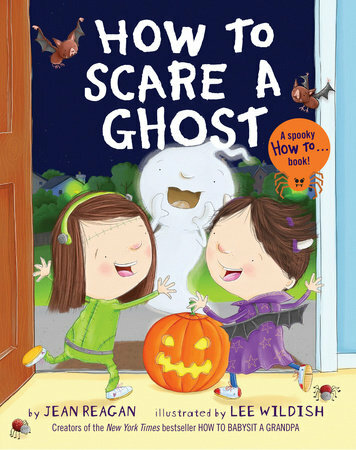 Filled with charming role-reversal humor, creative ideas, and lots of holiday spirit, How to Scare a Ghost is sure to delight kids, parents, and things that go bump in the night. How to Scare a Ghost was written by Jean Reagan and illustrated by Lee Wildish. It was published by Alfred A. Knopf in 2018. Do you want to scare a ghost? The easiest, spookiest time to try is…Halloween! I loved all the fun lists in this book! It’s a great example for a writer to check out for a how-to mentor text. I enjoyed the snippets of humor. Who knew ghosts love glitter? The illustrations show children of diverse backgrounds participating in fun Halloween and fall activities, giving child readers lots to explore. A fun, not-scary book to read as Halloween approaches. I love books that showcase list-making, though in this case the list items are scattered throughout with the illustrations. Share: Draw a picture or tell about what your family does on Halloween. If you celebrate, what are your Halloween traditions? If you don’t celebrate, what do you do instead? Design & Build: Could you make a trap for catching a ghost? What materials would you use? Write: Make a list of things to do when you are feeling scared. Oh, I'm so glad! Thanks for stopping by!! I really like that the children are in charge of scaring a ghost -- along with instructions! Sounds very entertaining. I love a well done how-to book. This is now on my library list. Thanks. I like the unique perspective -- the twisting around of who scares who. Sounds like a fun read! This is the perfect book for the season! I have a big basket I set out every October that I fill to the brim with Halloween picture books. I have a feeling this book will become a new member of my collection. A perfect choice for those kids who don't want to be scared or who like the idea of turning the tables on a ghost. Happy Halloween!